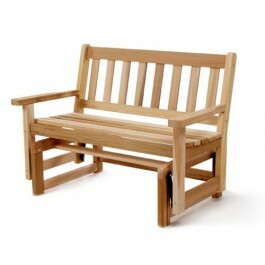 Lovely western red cedar glider, on sale now. Are you ready for a smooth swinging experience? Then check out this clear Western Red Cedar Glider Rocking Chair. This chair is built for two and is ready to offer hours and hours of low-key relaxation time. It's the perfect chair for your porch. Red Cedar is naturally rot-resistant and naturally insect resistant in addition to being extremely durable. The zinc-plated hardware is rust-resistant, too, making this glider rocking chair into a purchase that you can count on to last for years and years. The chair has been finely sanded for a smooth, comfortable finish. The handsome shaker slat design offers a touch of old world class to your home. This chair moves quietly thanks to quiet, smooth ball bearing glides. Glider chairs are also safer for small children and pets, since their "pinch points" are harder for little fingers and tails to get to. This chair arrives partially assembled; pieces are pre-drilled to make it a snap to put together. At only 45 pounds it's easy to move around whenever you are ready for a change. Don't you deserve to enjoy a quiet cup of coffee while sitting in a glider like this one? 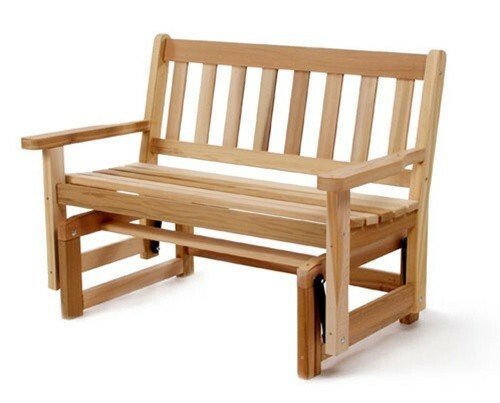 Order your Western Red Cedar Glider Rocking Chair today.